My story begins in a village in Vietnam…with a bomb and a photograph. Until June 8, 1972, the day napalm fell on Trang Bang, I was a happy child. I was nine years old; I knew nothing about war. My most serious injury had been scraping my knees when I fell off my bicycle. When the villagers were told to hide in the Cao Dai temple, it seemed more like an adventure. The temple was a holy place, a “safe” place. How could we imagine the horrible fire that would drop from the sky? It was only when the soldiers came and yelled for the children to run, that we got really scared. We were running up the road and suddenly there was a bomb, an explosion of gasoline. My clothes were burned off; my skin was on fire. Someone began screaming “Nong qua! Nong qua!” – “Too hot! Too hot!” That someone was me. Nick Ut, an AP photographer, was on the road. 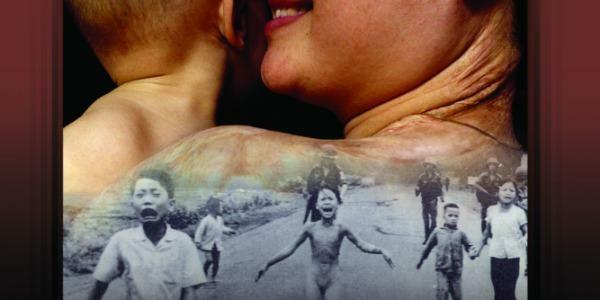 He took a powerful photograph of a naked young girl with a group of wounded innocent children caught up in an ugly war. That image touched people’s hearts. It became so famous it won the Pulitzer Prize. Some say it helped to end the war. That day changed my life forever. Nick took me to the hospital, where I spent many months close to death. Thanks to wonderful doctors, I survived. I had seventeen operations; my final one was in Germany in 1984. My recovery was long and difficult. When I left the hospital, I had to do painful exercises every day. Because of the scars on my back and my left arm, I didn’t feel pretty. How I envied my girlfriends who could wear short sleeve blouses! I was certain no boy would ever love me, that I would never have a normal life. I kept asking, “Why me”? I felt so bitter. I cursed those who had hurt me. I wanted them to suffer too. But, I knew I couldn’t live like that. I had to change my heart or die from hatred. For years I searched for answers. How would I find peace? One day, in the library, I discovered the Bible. I finally found my answer. At nineteen, I became a Christian. “Love your enemies”, Jesus says. When I first read that, I didn’t know how to do it. I had to pray a lot! I didn’t wake up one day and just say, “I forgive”. I learned that in order to be free, I had to learn to forgive. People who know me, know I love to laugh. They know that I don’t hold hatred in my heart. The question I’m asked all the time is, “But how, Kim? How did you come to forgive?” I can tell you, it wasn’t easy. I imagined a picture in my head, a cup full of black coffee. I emptied my hatred into that cup, all the pain and all the people who had hurt me. Then, I tried pouring the black coffee out, pouring out my hate, a little bit at a time. Of course, at first, the cup just filled up again. But practicing every day, the more I prayed for my enemies, the softer my heart became. God helped me. Slowly the black coffee became less. Then, one day there was no coffee left to pour…the cup was filled with light…with God’s love, and I felt forgiveness. It sounds easy but it wasn’t. It was the hardest work of my life. But I did it. If I can do it, you can too. Many veterans spoke with me. One man came out of the crowd and introduced himself. John Plummer told me he had been involved in planning the attack on my village, Trang Bang, the day I was burned. He had co-ordinated the air strikes. He said he had never forgiven himself and his life had been ruined. He asked me to forgive him, and I did. It was an emotional moment for both of us. I believe he was a victim, too. I have many such moments when I am out speaking with people. These are moments of love. The healing I went through made my body strong, but it also made my mind strong. It gave me the determination to fulfill my life goals. Today I live in a free country, Canada, with my wonderful family; my husband Toan, my two boys, Thomas, age 15, and Stephen, age 11 and my parents. I have been blessed to found The Kim Foundation, an organization that funds projects to help child victims of war. And, eleven years ago, I had another great honour: I was invited to become a lifetime Goodwill Ambassador for UNESCO, to work for a culture of peace. My picture was an accident of history. There happened to be a photographer on the road the day I was burned. But I never forget the millions of innocent victims who didn’t have a photographer to record their suffering. Forgiveness is a choice. It is the way forward out of the cycle of wars and violence.